Sogni dei Santi is a beautifully restored rustic hill top farmhouse with the best of modern design and creature comforts. The house sleeps 14 (7 bedrooms, 5 bathrooms) has stunning views over unspoilt valleys and hills, a large private garden, a private out-door pool with pool-house and a large outdoor seating area under a shady vine. Sitting under a 12th century watchtower and surrounded by fields and woods, it enjoys lovely views. On the ground floor are a large fully equipped modern kitchen with two ovens, US style fridge/freezer and seating area, a large sitting room equipped with TV/Video/DVD and Game Cube a dining room seating 14, a study, laundry and entrance hall. On the first floor are three double bedrooms with ensuite bathrooms, a twin and a another double bedroom that share a bathroom. Up a spiral staircase under the eaves on the second floor there is a further double room, twin room and bathroom with restricted headroom. Sogni dei Santi General Information: You will be greeted at the house by a wonderful local Italian who knows the house intimately and is on call for any problems that might occur. Many of your questions will be covered in the house notebook. You will be shown how to operate the security cover for the pool. Routine checks on the pool will be carried out during your stay and should cause minimal disruption. The pool has a diving board. There is a large airy garage with a ping-pong table, table football and comfy chairs for children to hang out in! A gardener will come once a week to mow the lawn & carry out general garden maintenance. Additional services available on request: Meet/ Greet and Emergency Assistance in English, Cook and Extra Cleaning, Baby Sitting. The garden is fitted with an automatic irrigation system. Mountains and Coastline : Sogni dei Santi is situated in an area of outstanding natural beauty -between the mountains and the sea. There are hiking and walking trails up into the nearby mountains. The ancient pilgrim route to Assisi runs through Aliforni hamlet. The Gola della Rossa-Frasassi National Park (30mins away) features a series of towering limestone gorges providing a habitat for rare golden eagles, peregrine falcons and eagle owls as well as Italy's largest and most interesting network of caves at Frasassi. The Cistercian Abbey of Fiastra (35 mins) is an inland nature reserve and home to a wide variety of animals and rare birds. 1 Hour from the house are the breathtaking mountains of the Sibillini National park. Monte Conero National Park, just south of Ancona, provides Le Marche with a dramatic and rugged stretch of coastline with secluded beaches & coves. It features thousands of species of maritime flora, is rich in bird life and has stunning views over the sea. European Blue Flags – 11. Food and Wine: Situated in central Italy, Le Marche represents the meeting point between the culinary traditions of northern and southern Italy. It has a vast variety of local foods - from the strong flavours that dominate the food in the mountainous areas, such truffles, mushrooms, salami & tasty 'porchetta', to the more subtle flavours of the coastal cuisine - such as 'brodetto del mare'. Large and juicy olives are another feature of Le Marche's gastronomic tradition. The famous Italian 'gelato' is also something to be enjoyed! The cultivation of vines in Le Marche can be traced back to Roman times and viticulture in the regions thrives to this day with 24,000 hectares under vine, a third of which is doc. The most famous wine of the region is Verdicchio, a white wine produced in Jesi and Matellica (30mins away). Excellent reds are Rosso Conero, Rosso Piceno and Lacrima del Morro d'Alba. Good sparkling wines and spirits are also produced in the region. Art historian, Italian and French speaking. Love of Italy - food, history, culture and countryside. We fell in love with the Le Marche region and in particular were drawn to this unspoilt area. We totally rebuilt the house which was originally a ruin. Wonderful views, an ever changing landscape, sun on the pool from dawn till dusk, beautiful walks. 4 Poster ensuite has a free-standing double-ended bath, large separate shower cubicle All bathrooms have fine Egyptian cotton towels, bathmats and facecloths. Fully installed gas central heating for use during the winter season. Gas supplement is charged based on usage. Kitchen - all appliances are top-quality: large American-style fridge with ice dispenser, double Siemens oven, 90cm hob with wok burner, separate drinks fridge, double sink and separate prep bowl. Modern central heating system throughout. Wide-screen TV with video/Cd player and game cube with games. Stereo speaker system to use with guests' iPod and small portable CD player/radio. Large table football and table tennis table! All linen, quilts, duvets, pillows of very high quality, swimming towels provided. Waterproof mattress protectors available for young children. Pool - measures 12 x 6m, with diving board and EU certified security cover. Pool house with changing room, outdoor table and 14 chairs, portable BBQ. The property has its own well and cistern connected to an automatic irrigation system which waters the lawn and plants. The lawn and garden are maintained regularly. The roof and tiles have been treated to avoid wasp/bee/insect infestation. 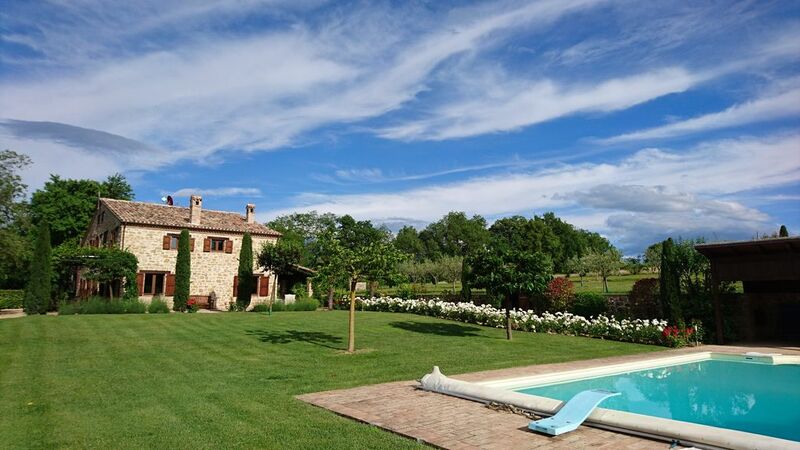 After viewing literally hundreds of properties online in Le Marche and Umbria we settled on Sogni Dei Santi as it looked ideal for our group of 12 adults and 3 babies. As we drove up the lane approaching the property we instantly knew that we had made the right decision. It is fabulously situated between two small hamlets with the most stunning 360 degree views. The house has been beautifully laid out and very tastefully furnished. The downstairs has a very large lounge/diner and a very well equipped kitchen. We spent many a happy hour cooking up some real treats using the fabulous local produce and enjoying a glass or two of local wines. The first floor bedrooms are beautifully done - the Master bedroom with its huge four poster bed and massive en-suite bathroom and double aspect views is quite breath-taking. Outside, the gardens are very thoughtfully laid out with lovely lawns dotted with Mulberry trees for a bit of shade (the Mulberrys were very tasty too), a gorgeous rose bordered path to the pool area and very pretty borders alongside the fabulous veranda. There is also a herb garden next to the vine covered seating area on the north side of the house - very handy to be able to pick fresh herbs. The pool is lovely and I have to say that the table tennis table got loads of use whilst we were there. At night the place is ideal for star gazing. The local area is absolutely gorgeous with many little hill top towns and villages. San Severino is a lovely little town and is the closest town with decent supermarkets. The town square is beautiful and comes alive in the evenings. The local cafes and restaurants offer tremendous value - 12 euro for 10 coffees. Cingoli is also well worth a visit and is only 20 mins or so from the house. Again, we were amazed at the prices in the I Ponti restaurant at Lago Di Cingoli . The restaurant is full of locals and I can understand why. The food was amazing, excellent quality rustic fare at incredible prices - a plate of pasta with local wine and coffee for less than 11 euros per head. In the house information pack Joss makes some excellent recommendations for things to do and local food producers. One trip that you absolutely have to make is to the pig farm that produces the most wonderful salamis and prosciutto at very reasonable prices. In summary, we couldn't have been happier. We spent a wonderful fortnight at Sogni Dei Santi and were very upset to leave. Stunning weather and beautiful surroundings. The pool was fabulous. This was our second stay at this wonderful house. We love it! it is very secluded which is fantastic when we'd just arrived from the bustle and busy-ness of both Rome and the Amalfi coast! It has everything you would need for a big group. The kitchen is incredibly well stocked with every utensil, pot and pan you'll ever need and in a size that's suitable for catering en masse. The pool area was perfect and even though the pool wasn't heated, we used it all day and the sun had heated it up nicely. We love this area - it has the feeling of being quite untouched and the towns are so beautiful and charming. We didn't explore much, however, preferring to relax by the pool and have long meals on the veranda. We couldn't recommend it more highly. We love it when our guests return! It is indeed a great compliment! Thank you. We had a wonderful few days in this lovely family house. Le Marche is an incredible region with beautiful old towns and stunning scenery. This house was the perfect base to explore, very comfortable and well-equipped with wonderful outside space and a great pool. We could have stayed four times as long! It really would be impossible not to love everything about this house. The property is absolutely gorgeous: beautifully spec-ed and looked after and lovely and luxurious whilst still being welcoming and friendly. The gardens are equally perfect: so well cared for, planted and laid out and a complete pleasure to sit in or wander through. And the setting - it is honestly spectacular. One of the most peaceful but positive places we've ever been. Thank you for your lovely review! It's so nice to hear that you enjoyed the house and garden and appreciated the beautiful setting. Stunning location, beautiful property and the garden and pool were a real treat. Eating meals outside looking out over the hills was so relaxing and we loved every minute. Sogni dei Santi is situated in an area of outstanding natural beauty, within easy reach of the mountains & sea. The medieval town of Cingoli, 'Balcony of the Marches', is 15 mins drive away with panoramic views over the hills to the sea. It is the birthplace of one of Italy's Popes, with important churches & a museum. San Severino, 'City of Art', lies in the valley below (10 mins drive), & has shops, museums & a beautiful central piazza. The Frasassi Caves nearby are the longest in Italy, one chamber large enough to hold Milan Cathedral! Macerata is host to the famous open air opera season at the 'Sferisterio' (40mins from the house) which runs Jun-Aug. Throughout the summer there are pageants & palios & food & wine festivals in the local villages. Further afield is Urbino, the world-famous Renaissance town & birthplace of Raphael (1hr 40mins) & within 1.5- 2 hours are four of Italy's most famous theme parks (Mirabilandia, Fabilandia, Le Navi & Italia in Miniatura). Golf: There is a beautiful golf course 30mins drive in the grounds of the Abbey of Fiastra. Ski: There is skiing 45 mins away at Sarnano in the Sibillini Mountains.